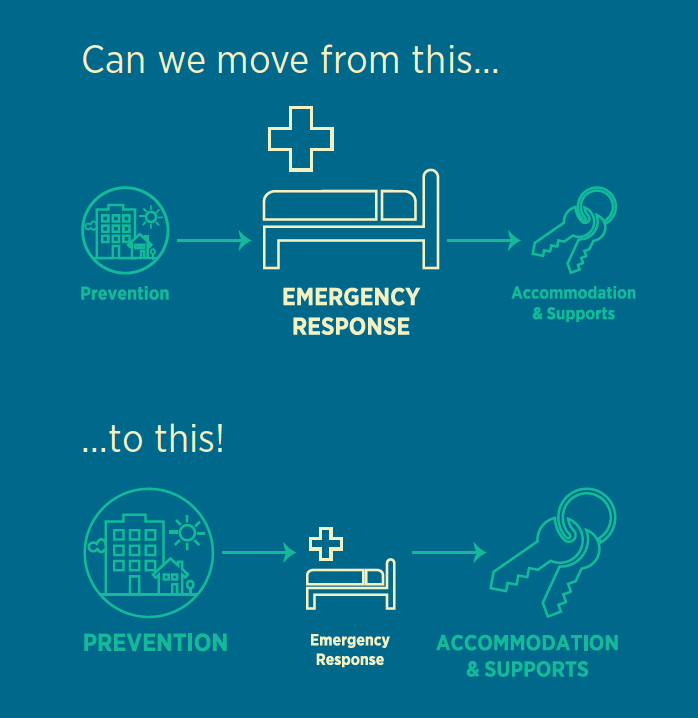 Prevention – Stopping people from becoming homeless in the first place. Emergency Response – Providing emergency supports like shelter, food and day programs, while someone is homeless. Housing, Accommodation, and Supports – The provision of housing and ongoing supports as a means of moving people out of homelessness. The international evidence reveals that homelessness prevention makes sense from social and economic perspectives (see research from Australia, Wales, England, United States, and Canada). Evaluations of prevention initiatives in Germany, England, and the UK demonstrated that prevention contributed to the reduction of homelessness. A range of prevention interventions, from evictions prevention, support for survivors of intimate partner violence, to landlord mediation, all showed success. In Canada, research on the importance of discharge planning from correctional facilities, hospitals, and shelters provides evidence that prevention efforts can and will be successful in the Canadian context. Research continues to inform emerging practices to support key populations including, youth, veterans, families, and those with high-needs such as addictions and/or mental health challenges. 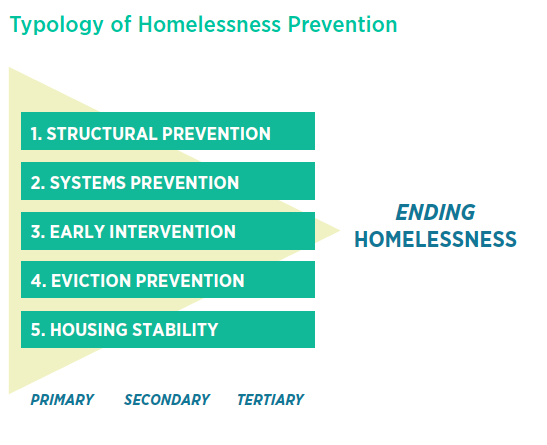 While there continue to be gaps in the knowledge on homelessness prevention, particularly as it relates to evaluation and measuring outcomes, the evidence is mounting that it is effective and worth investing in. The causes of homelessness include individual and relational factors, broader population-based structural factors, and the failure of many public institutions to protect people from homelessness. This suggests that homelessness prevention must not only include interventions targeted at individuals, but broader structural reforms directed at addressing the drivers of homelessness. That not only communities but all orders of government, and most departments within have a responsibility to contribute to the prevention of homelessness is in keeping with a human rights perspective. Homelessness prevention adapts the public health model of prevention, which has been used since the 1940s to reduce the risk and harms associated with illnesses. The public health model provides a range of prevention interventions that should take place simultaneously. Universal prevention – policies and interventions that target the broad public. While these strategies do not always have homelessness prevention as their goal, they have the effect of reducing the risks of becoming homeless by creating greater equality, which is vital to homelessness prevention. Examples include having an adequate supply of affordable housing and poverty reduction strategies, such as greater access to affordable child care. Selected prevention – prevention efforts aimed at members of a particular group, such as school-based programs and anti-oppression strategies for individuals facing discrimination, in particular Indigenous Peoples. It also includes programs aimed at low-income people, such as the basic income program currently being piloted in Ontario. Indicated prevention – applies to all those who are disadvantaged to ensure they do not become homeless in the first place. Examples of indicated prevention include support for families experiencing violence and individuals facing mental health and addictions challenges. Those intervention strategies aimed at those who are at imminent risk of homelessness (i.e. received an eviction notice) as well as those who have recently become homeless, with the aim of avoiding homelessness or moving out of homelessness as quickly as possible. Secondary prevention includes a range of options from emergency financial assistance, family mediation, and domestic violence victim support, to name a few. Prevention initiatives that support individuals and families who have previously experienced homelessness to ensure that it doesn’t happen again. The Housing First model is a type of tertiary prevention by providing chronically homeless individuals with housing and supports to maintain housing stability. These classifications exist along a continuum. In order to effectively prevent homelessness, all three forms of prevention must occur simultaneously. Most of the prevention programs that exist in Canada and internationally fall into the secondary prevention category. While these interventions are crucial to support those in crisis, secondary interventions alone cannot prevent homelessness. Structural and systemic interventions that work at the level of primary prevention are needed to provide the policy, practice, and funding backbone for individual interventions to be successful. Legislation, policy, and investment that builds assets, and increases social inclusion and equality. Addressing institutional and systems failures that contribute to the risk of homelessness. Examples: Barriers to accessing supports, such as transportation challenges, disability, linguistic barriers, cost, citizenship requirements, difficulty with system navigation, etc. Policies and practices to support individuals and families at imminent risk of homelessness or who have recently become homeless. Programs and strategies designed to keep people at risk of eviction in their home and avoid homelessness. Initiatives and support for people who have experienced homelessness that allows them to exit homelessness quickly and never experience it again.